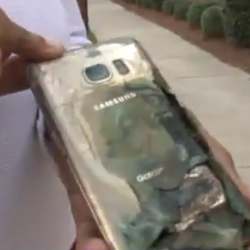 A 27-year old senior at Old Dominion University by the name of Shaunique Lamb, says that her Samsung Galaxy S7went baa...d. The handset caught on fire while inside a cup holder. What made the incident so serious was the fact that Lamb was driving her car while the smoke was billowing out from the phone. Lamb said that the phone was not plugged into the charger, but was synced to Bluetooth so that she could listen to music being played from an app on the device. The incident took place on February 23rd, and Lamb was able to escape serious injury by pulling off to the side of the road until the smoke cleared. What had her shaken up was the thought that she usually has the phone on her person. Having escaped personal injury, Lamb couldn't escape financial harm. She took the phone back to the Sprint store from where she had purchased it, and was told that even with her Asurion insurance plan, she would have to pay a $200 deductible. Lamb said that she was in touch with Samsung, but was afraid that the manufacturer wasn't taking the matter seriously. Samsung did release a statement that said that it needed to physically examine the device in question so that it could determine what happened. Based on Sammy's statement, it would appear that Samsung has yet to receive the burnt remains of the phone from Lamb.